I’ve got a lot of projects I’m planning on sharing this year, and today I’m excited to share the very first project of 2016! It’s little sneak peek at Rachel’s bedroom makeover. The reading nook. Which happens to be one of my favorite spaces in the room. 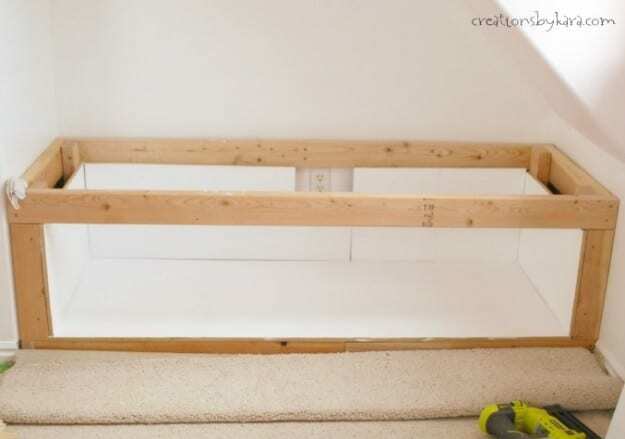 She’s not quite old enough to love independent reading yet, but I’m sure in a few years we’ll find her curled up with a good book in this cute little space. 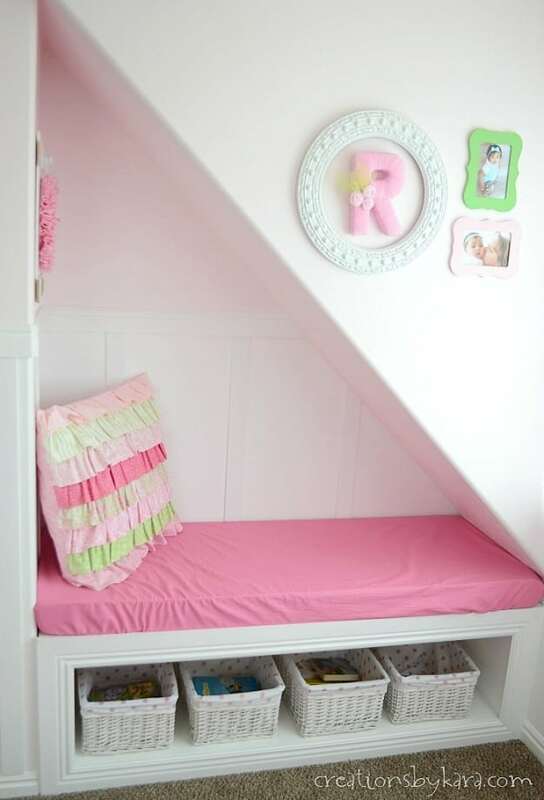 Her room was previously the playroom, and it had this little awkward space that I never knew what to do with. 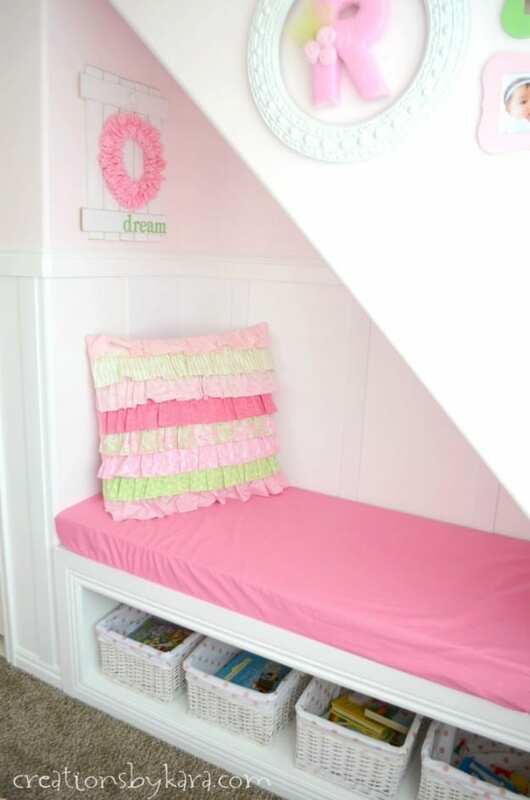 Then my friend Brittany shared a closet turned reading nook, and I finally knew how I could make this space fabulous! I loved the idea of adding storage, so we lined the bottom with MDF boards that I painted white. We found the white lined baskets at Hobby Lobby, and four of them fit in the space just perfectly. I wanted the space to be nice and cozy, but I also wanted it to be easy to keep clean. I simply cut down a piece of foam, then sewed a fitted sheet to cover it. It is easily to remove and toss in the washer when it needs cleaning. 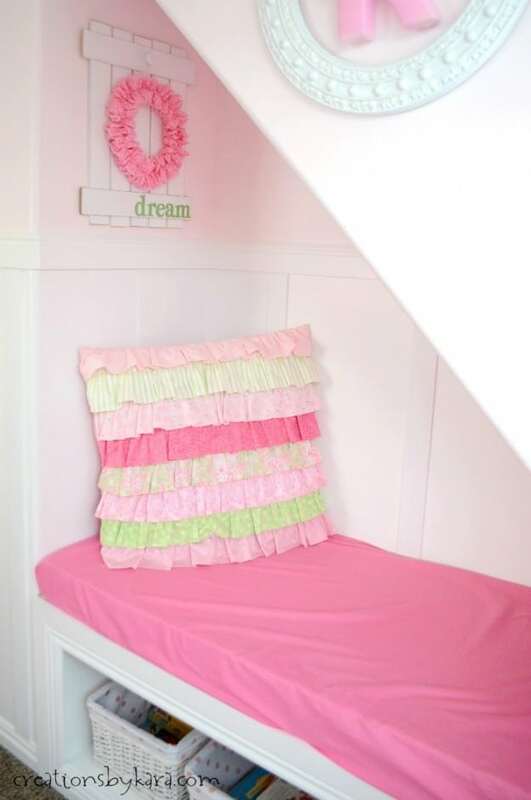 I also bought a large pillow, and sewed a ruffled pillow cover for it. (Tutorial hopefully coming soon.) It is super comfy to lean against, and the cover can be removed and washed. Because kids are not known for their cleanliness. At least not at my house. Ha. I’m not going to share a full tutorial, you can check out Brittany’s post for that. I’ll just share some of the tricks and tips we learned along the way. First up, since we weren’t going to be replacing the baseboard in the room, we just had to remove it in this space. 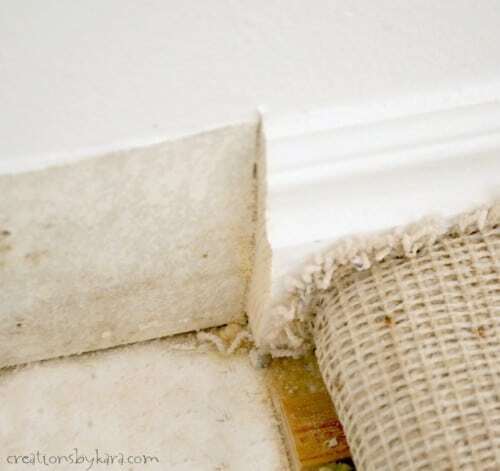 We used a Dremel Multi-Max to make a perfect cut down the baseboard right where we needed it to end. We had tons of 2×4’s left over from another project, and we wanted to use them rather than purchasing new ones. Not all of them were long enough, so we screwed the support structure together with scraps. Saved us a ton of money. It doesn’t look pretty, but it’s sturdy. And since you can’t see it, it doesn’t matter what it looks like. You can often times use what you have if you just get a little creative! Another tip is to paint the MDF lining boards and all of the trim pieces before you attach them. 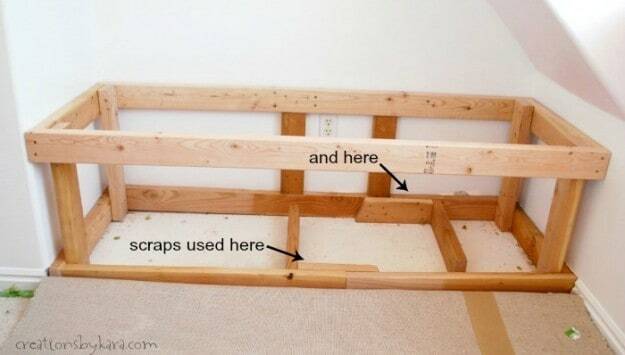 Then after you attach them with your brad nailer , you will just need to fill and paint the tiny holes. So much easier than trying to paint the whole box from inside it! And look, once we added the inside boards, you can’t even tell that we used scraps! After adding the trim and all the fun accessories, this little reading nook is now one of my very favorite spaces in our whole house! These are the tools we used to put together the reading nook. I love my power tools! Such a lovely idea! 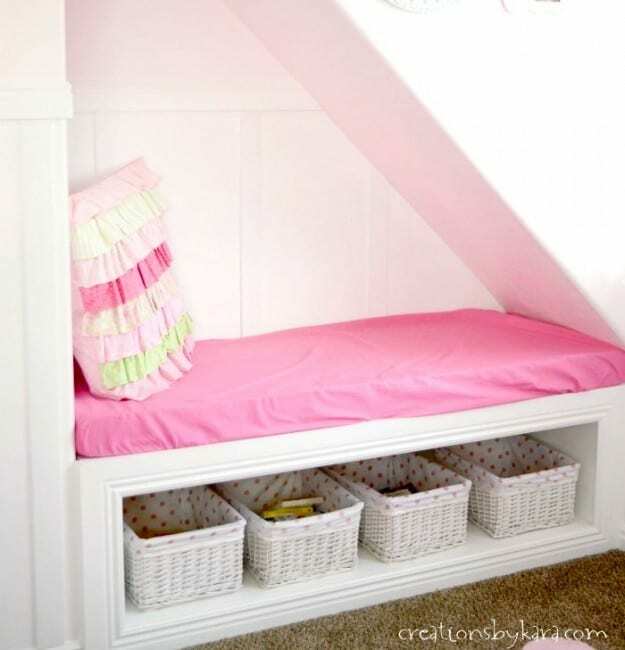 I find such weird places very nice for creating reading nooks! You are so right to think about ways to keep it clean! I often forget about this such an important issue. I think that you turned this place into a wonderful and special place for your daughter! Well done! Thank you for sharing! It looks lovely!!! I love reading nooks. Great idea with the baskets, my kids really struggle with lining up their books! 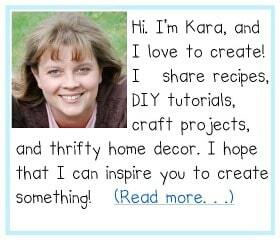 Kara, it looks amazing! What a great way to use that awkward space. I’m sure she loves her new reading nook. Thanks Brittany! And thanks for inspiring me to tackle this space!